Using storytelling or fables in a lesson plan for your first grade students will introduce them to this type of literature, as well as let them see the purpose of such narratives. Students will listen to an example of a fable. Students will answer questions about the story and predict what will happen next. Students will offer their own examples of morals and lessons to the rest of the class. Students will draw pictures and write sentences demonstrating their understanding of the lesson. Students will provide their own examples of stories or fables with lessons or morals in them. What is this character like? Can you tell me what happened so far in the story? These questions serve to introduce students to the art of story telling, as well as to the important aspects of listening and reading. What did you learn from listening to this story? 3. A very brief lecture ensues in which the teacher explains the definition of a moral. What are some other lessons or morals that you know? What lessons or morals do you have in your home? Have you read other stories with morals or lessons? What were they? 5. The students are asked to draw a picture from the story which shows the main character learning the lesson or moral. Underneath the story, students must write down what the moral or lesson that is being demonstrating in the story. The teacher will circulate in the classroom to help with any questions regarding ideas, words, sentence structure, spelling etc. 6. Homework: The students are asked to bring in their favorite book that has a moral or lesson in it to share with the rest of the class. Since you are working with very early learners, remember that there is probably a wide range of skills present in your classroom. Select a book that is not too challenging for the students at beginning levels, but not too boring for the more advanced students. Writing is another skill that is just developing at this time. Be prepared to offer assistance to your students and remain patient if they are struggling with forming letters. Allow some time for the homework assignment to be completed. Not all students will have lesson or moral books at home. A substitute idea for this homework assignment is to have each student select a book with a moral or lesson the next time that the class takes a trip to the library. If you teach older students, you could still use this lesson plan as a framework, and add different types of age appropriate activities to the lesson plan so that it is suitable for the grade level. "Lesson Plan on Storytelling or Fables for First Grade Children." YourDictionary, n.d. Web. 24 April 2019. 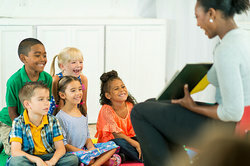 <https://education.yourdictionary.com/for-teachers/lesson-plan-storytelling-fables-first-grade-children.html>.